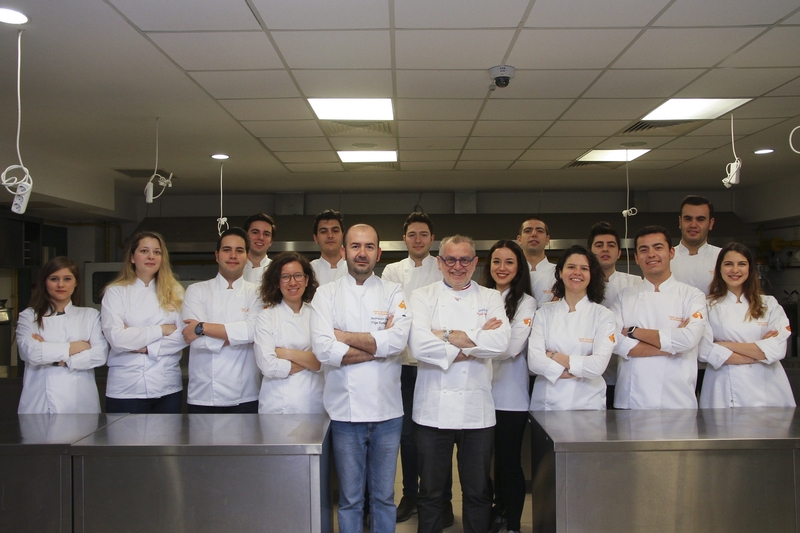 Exquisite tastes of Aegean and Turkish cuisine will go global with young chefs of Izmir University of Economics (IUE). All the groundwork for Izmir, the 23rd city that became a member of DELICE Network of Gourmet Cities in 2015, to become a worldwide gourmet city is taking place at Izmir University of Economics. 86 students from Department of Culinary Arts and Management performed their internship, and experienced the details of world cuisine at Michelin Starred restaurants in France so far, and this year 16 student chefs will perform their internship for 3 months with Michelin starred chefs. Students did a lecture with Michelin starred famous French Chef Joseph Viola, Lecturer at IUE Department of Culinary Arts and Management who has been awarded the Best Chef Award in 2014 in France, and selected their internship places in France. Ekrem Demirtaş, President of IUE Board of Trustees, reminded that two student chefs went to Lyon, France for their internship in 2012 for the first time. Demirtaş said, “86 students performed their internship at Michelin Starred restaurants up until now. We entered the DELICE Network of Gourmet Cities in 2015. I have co-signed the membership agreement for DELICE Network of Gourmet Cities in Lyon, France in 2015 with Aziz Kocaoğlu, Izmir Metropolitan Mayor. Izmir is among the 23 cities in the network. Our city is not a gourmet village; it is being represented at international platforms. IUE students learn about world cuisine while performing their internship and get a chance to put the theoretical knowledge they learn at the university into practice. All the groundwork for Izmir to become a worldwide gourmet city is taking place at the University”. “We are a nation coming from Middle Asia. We brought many different values, tastes regarding food culture from Europe, Middle East, and Asia until we settled down in Anatolia. When mentioning Izmir, we should not forget about our herbs and seafood,” said Demirtaş. He said that they represented Aegean and Turkish cuisine at events organized within Delice Network, and pointed out the importance of internship experience abroad in terms of students’ career goals. Demirtaş said, “Our students learn about the details of Aegean and Turkish cuisine, and they experience world cuisine with starred trainer chefs. Some part of their internship take place abroad. We have always pointed out the fact that we trained entrepreneurial and innovative youth. After they graduate, our students either work at starred restaurants abroad or open up their own businesses. We take our place among gourmet cities a step further each day”.